The average cost of assisted living in Suffolk is $3,804 per month. This is higher than the national median of $3,346. Cheaper nearby regions include Portsmouth with an average starting cost of $3,745. To help you with your search, browse the 12 reviews below for assisted living facilities in Suffolk. On average, consumers rate assisted living in Suffolk 4.5 out of 5 stars. Caring.com has helped thousands of families find high-quality senior care. To speak with one of our Family Advisors about assisted living options and costs in Suffolk, call (855) 863-8283. Suffolk, an independent city, is considered the largest in land mass within the Commonwealth of Virginia and has a senior population of around 21,765, which is 25 percent of the overall community. 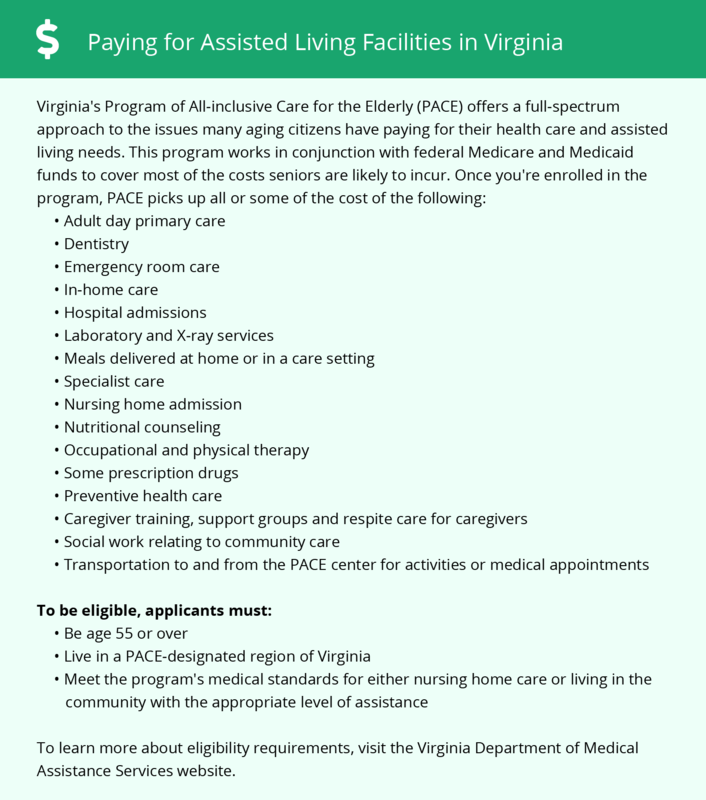 As a way to accommodate this senior community, there are five local and 26 assisted living facilities (ALFs) nearby that are regulated by the Virginia Department of Behavioral Health and Developmental Services (DBHDS). Each community is licensed as either residential living care or assisted living care; the latter is licensed to care for seniors requiring significantly more help with activities of daily living (ADLs). Residents of Suffolk pay a slightly lower cost of living than in others in the state, ranking a 105 compared to the 107-point state median. Seniors living here spend more on expenses such as health care, utilities and goods and services when compared to other neighborhoods in both the state and the nation. The town does offer lower expenditures on groceries though. Suffolk has higher violent and property crime rates when compared to the national average, by 26 percent and 29 percent, respectively. The town is only 13 percent safer than all neighborhoods in the state, which could be a safety concern for seniors. Suffolk seniors often breath fresher air with an air quality index that is 21 percent better and pollution index 63 percent better when comparing to the national averages. Residents with respiratory problems may benefit from a better quality of life living here. The town of Suffolk experiences hot, muggy summers with humidity levels as high as 88 percent during July. Temperatures will often range between 62 to 89 degrees from May to September. Winters are usually mild here where temperatures rarely fall below 32 degrees, making it easier for seniors to travel around town. The Suffolk area is home to world-class medical facilities, including Bon Secours Health Center at Harbour View, Sentara Belle Harbour and Sentara Obici Hospital, in the event of medical emergencies or illness. Suffolk has an array of community resources for seniors, including the Suffolk Parks and Recreation, an organization that provides a variety of activities to the 55 and up community and partners with Senior Services of Southeastern VA to provide meals and transportation. Assisted Living costs in Suffolk start around $3,804 per month on average, while the nationwide average cost of assisted living is $4,000 per month, according to the latest figures from Genworth’s Cost of Care Survey. It’s important to note that assisted living rates in Suffolk and the surrounding suburbs can vary widely based on factors such as location, the level of care needed, apartment size and the types of amenities offered at each community. The Auxiliary Grant Program, Supplemental Security Income (SSI) and the 1915 (c) Home and Community-Based Services (HCBS) waiver program are three programs Suffolk seniors may qualify for to receive financial assistance. Suffolk and the surrounding area are home to numerous government agencies and non-profit organizations offering help for seniors searching for or currently residing in an assisted living community. These organizations can also provide assistance in a number of other eldercare services such as geriatric care management, elder law advice, estate planning, finding home care and health and wellness programs. To see a list of free assisted living resources in Suffolk, please visit our Assisted Living in Virginia page. Suffolk-area assisted living communities must adhere to the comprehensive set of state laws and regulations that all assisted living communities in Virginia are required to follow. Visit our Assisted Living in Virginia page for more information about these laws.